We are offering Plastic Dustbin to our clients. We are a leading manufacturer, supplier, & importer of Conductive Plastic ESD Bins. 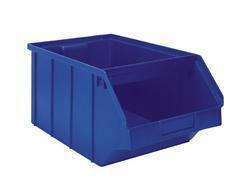 our organization offer this product Bin & Drawer to our valuable customers. These products are available in numerous shapes, sizes and colors. these product are manufactured with best quality material and tested at industries quality standard. These product are used for small parts storage, like electrical components, auto parts and many more.